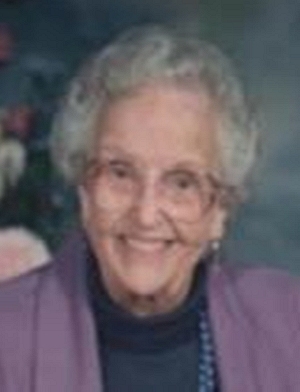 Obituary – Scholz, Sybil Lorena (Clark) « Perry High School Alumni Association, Inc.
Sybil Lorena Scholz, 95, of Perry passed to a better life on Wednesday, February 3, 2010, at Green Valley Nursing Home. She was born January 19, 1915, in Kendrick, OK, the first child of S.A. and Elsie Clark. She was a graduate of Perry High School and married Joseph Anton Scholz on January 21, 1939, in Perry. They had two sons, Harley Joe and Jerry Duaine. Sybil had a multitude of experiences in her long life. In her elementary school years, her family lived in a boxcar next to the tracks where her father was a section foreman for Santa Fe Rail Road. As the tracks were repaired, the section gang moved to a new location and the Clark children, Sybil and Harley, changed schools. Sybil lost count of the schools she attended during that time, but she often said she had lived in almost every little town in Oklahoma. As a young woman, she was the vocalist for her father’s dance band, and she sang at dances held in various places throughout Noble County almost every weekend. It was at these events that she met Joe Scholz, a young farmer who lived in the Bohemian community north of Perry, near Red Rock. After they were married, she was a busy farm wife who also worked outside her home to supplement the family income. Her employer was Jerry Prucha of J&J Implement Company, the Oliver farm implement dealer. She was song leader and Sunday school teacher for years at Ceres Christian Church, and she helped a number of children find faith in Jesus’ salvation. When her sons went off to college and, later, medical school, Sybil took up painting and developed a local reputation as a landscape artist. In fact, her paintings still are hanging in some Noble County homes. Joe died in 1992 after several years of ill health, during which Sybil was a supporter and caretaker. After his death, she led an independent life until she was over 90 years old, in spite of a number of health challenges. She graciously moved into her son’s home when her health forced her to give up her home, and she blessed that family with her presence for almost four years. Until four months ago, she had filled her time with Sudoku puzzles, reading her Bible and the latest novels, and conversations with her children, grandchildren and friends (including her dog, Tigger, one of her best friends). A stroke changed her life, and on her 95th birthday 15 days before her death, she announced it was going to be her last birthday. Sybil was loved by everyone who knew her. Her family has been blessed to have her in our lives, as a quiet teacher and model for a Christian life. Sybil is survived by her sons: Harley Joe and his wife, Sue, of Perry and Jerry Duaine of Skiatook, OK, and her grandchildren: Karl Scholz and his wife Penny of Bar Nunn, WY; Kurt Scholz and his wife, Laura, of Sierra Vista, AZ; Kristin Brunelle and her husband, Martin, of Peoria, AZ; Harli Jill Franklin and her husband Travis, of Fort Collins, CO; Adrienne Sarcoxie and her husband, R.J., of Oklahoma City; Clinton Scholz of Ramona, OK; and Clark Scholz of Ramona, OK. She is also survived by nine great-grandchildren: Logan, Gennadean and Joe Scholz, Grayson Burrow, all of Arizona; Olivia and Elyse Franklin of Colorado; and Noah, Lili and Lilah Sarcoxie of Oklahoma. Her brother, Harley Clark, and his wife, Virginia, of Hendersonville, NC, also survive. The funeral service will be at 2 p.m. Saturday, February 6 at Ceres Christian Church, north of Perry on Highway 77, with Chris Short officiating. Burial will be in the Bohemian Cemetery north of Perry. Services are under the direction of Perry Funeral Home. In lieu of flowers, the family requests gifts to either the Ceres Christian Church or First Christian Church of Perry.